Suitable for full frame and cropped sensor cameras, the new extremely compact Sigma 105mm F2.8 EX DG OS HSM Macro offers advanced close up performance with true macro 1:1 magnification. The HSM (Hyper Sonic Motor) ensures quiet fast autofocus as well as full-time manual focussing capabilities. Sigma's OS (Optical Stabilizer) allows close-up hand-held focussing, whilst the 9 bladed aperture renders out of focus backgrounds beautifully. SLD (Special Low Dispersion) technology provides correction for distortion and aberrations of all types. 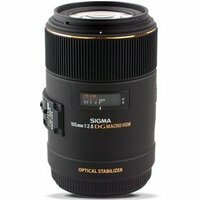 This lens is also suitable for use with Sigma's APO teleconvertors. Case, Bayonet type Hood (LH680-03), Hood Adapter (HA680-01) supplied.